Home » national news » Priyanka Gandhi vs Smriti Irani: one year before polls, BJP & Congress to select their CM candidate for UP? Priyanka Gandhi vs Smriti Irani: one year before polls, BJP & Congress to select their CM candidate for UP? Chief Minister Akhilesh Yadav of Samajwadi Party is all set to be his party\'s chief ministerial face in the polls too. Union Home Minister Rajnath Singh, who helmed the state between 2000 and 2002, and commands considerable influence in the party, is another. With Nitish Kumar's success in neighbouring Bihar fresh on their minds, major political parties may announce their chief ministerial candidates ahead of the Assembly polls in Uttar Pradesh. Incumbent Chief Minister Akhilesh Yadav of Samajwadi Party is all set to be his party's chief ministerial face in the polls while BSP supremo Mayawati, a Rajya Sabha member, will look to steer her party to a comeback in the key Hindi heartland state and rule it for the fifth time. BJP and Congress are thinking of naming a chief ministerial candidate too. Union Minister Smriti Irani, who took on Congress vice president Rahul Gandhi in Amethi in the Lok Sabha polls, is touted to be a probable candidate. Union Home Minister Rajnath Singh, who helmed the state between 2000 and 2002, and commands considerable influence in the party, is another. In poll-bound Assam, BJP has nominated Union Minister Sarbananda Sonowal as its chief ministerial candidate following the party's debacle in Bihar where it had not projected any leader for the hot seat. UP had played a stellar role in Narendra Modi's hugely successful prime ministerial campaign in 2014, with BJP clinching 73 of the state's 80 Lok Sabha seats. Modi himself represents Varanasi in Parliament. Some Uttar Pradesh Congress leaders, speaking on the condition of anonymity, say it would not be a surprise if the party announces a CM candidate in the next six months. If it does, it would be the first time that the party took such a move in the politically crucial state. 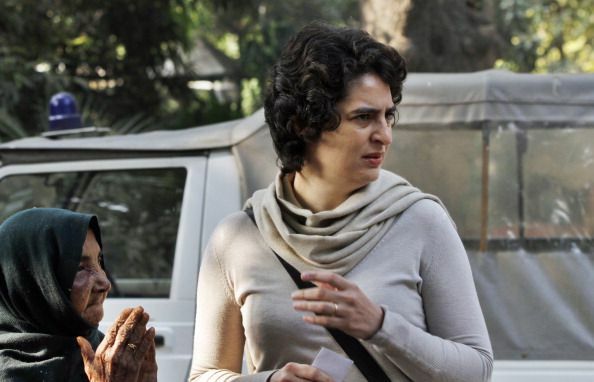 The name of Priyanka Gandhi is being suggested by many in the party who feel she alone has the charisma to pull the Congress out of the morass it finds itself in the state. However, another section is dismissive of such a possibility, saying Priyanka has a pan-India appeal and should not be pitchforked into an electoral contest in UP. Election strategist Prashant Kishor, who has been roped in by the Congress for the UP polls, has sought a candid response from the state leaders on the issue. At a meeting convened by Congress vice president Rahul Gandhi earlier this month, Kishor discussed whether declaring a chief ministerial candidate would make or mar the prospects of the party in the cow belt state.